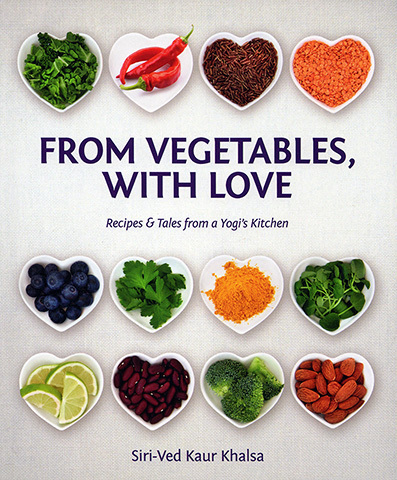 In From Vegetables with Love, Siri Ved Kaur, Yogi Bhajan's personal chef from the 1970s, provides you with over 300 mouth-watering recipes, along with a veritable cornucopia of information concerning the yogic approach to food and diet. She has included details of the healing properties of many natural foods and herbs, along with extremely helpful "yogi kitchen tips", and many amusing anecdotes from her years spent preparing delicious meals in Yogiji's kitchen. It was fun being in the kitchen with Yogi Bhajan. There was something about how he just seemed to use whatever ingredients were in front of him to create indescribable and heretofore unknown tastes. Like many of his teachings, these new tastes proved to be beneficial, satisfying and eventually habit-forming. One of Yogi Bhajan's earliest students, Siri Ved served as his personal cook in the 1970's. It was in his kitchen that her natural aptitude for preparing healing foods was nurtured and first blossomed. She learned by his side in the kitchen and at his feet as a student, discovering the secrets of the creation of amazing food with a unique yogic flair.